Family Matching Game GIMP tutorial on how to add a picture and change the color of it. To start off I will give you the pictures. 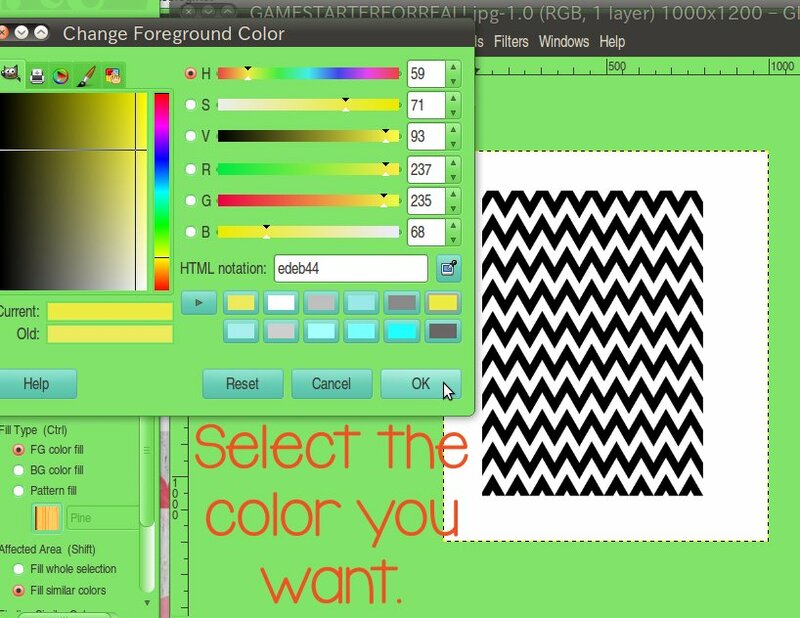 I will show you how change the color and how to add a picture. It’s easy, I promise! Just right click and save picture as. Again just right click and save picture as or save image as. 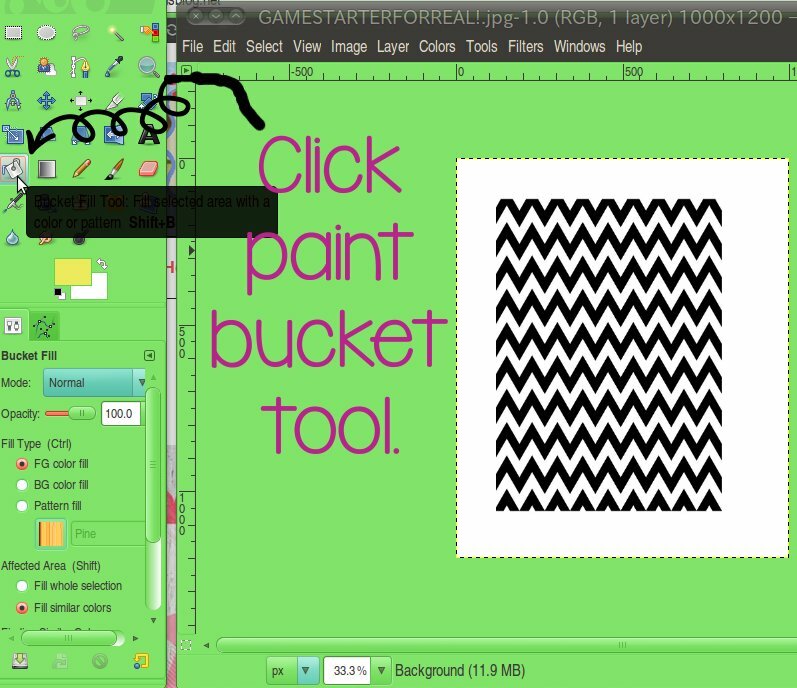 Here is my Gimp tutorial on how I added the pictures and changed the color of the chevron. I really hope this helps you all! 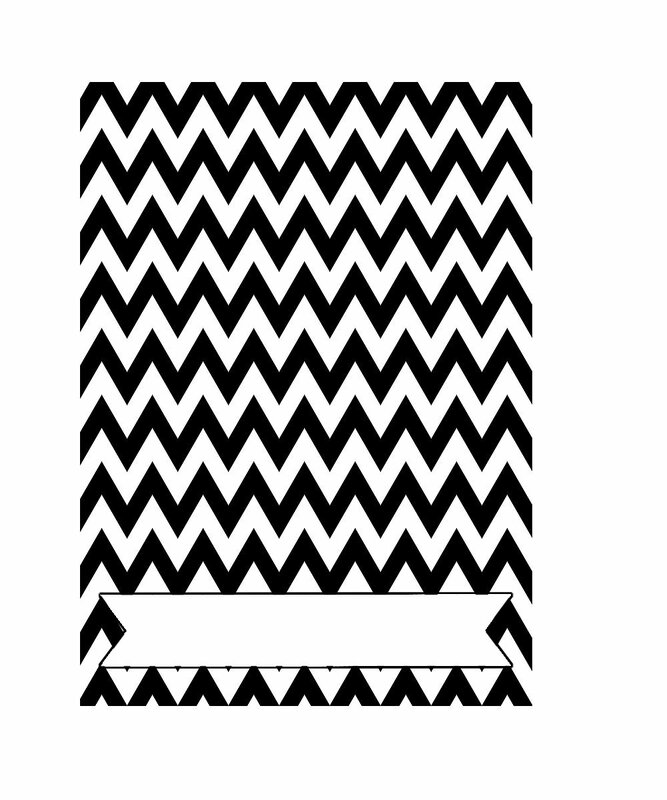 Step 1: Start out by opening your black chevron background you just saved, into GIMP. To do this go to File; Open; and click wherever you saved the photo. Step 2: Changing the black to a different color choice. Click the top square below all the tools, it should be black but mine is yellow in the picture. Step 3: Once you click the top box it will open up a color changing box and should say, “Change Foreground Color”. -Choose any color you’d like then press okay. The box should now have the color you chose instead of black. 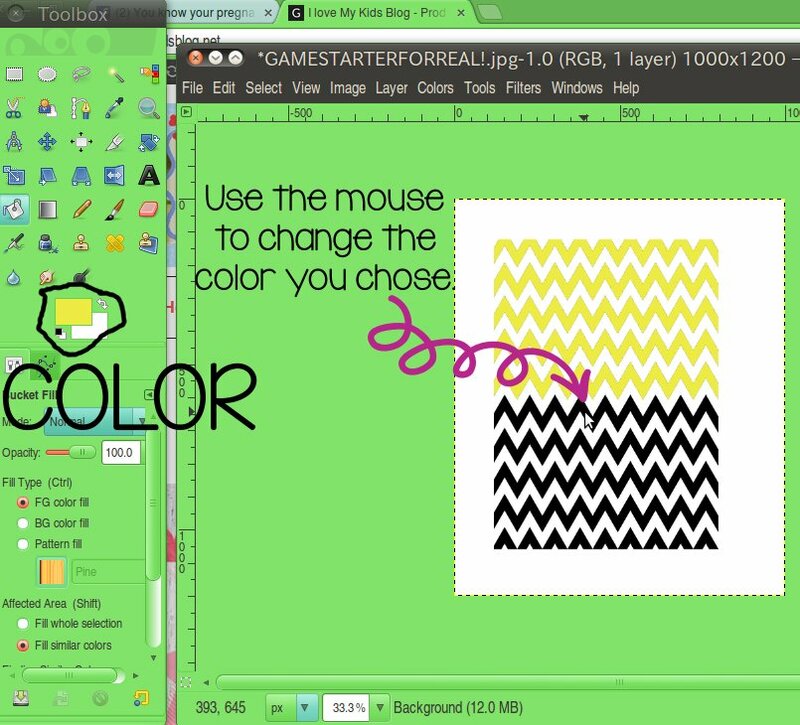 Step 4: Take your mouse and click on the black chevron and it should change the color. In the picture below mine turned yellow. If you mess up you can go to the top and click Edit; Undo. That will undo your mistake. Step 5: Adding the Picture! To get the picture you want you might have to crop the picture before hand. You could make it a smaller size as well, but if not I will show you how to make a picture bigger and smaller. -Start out by going to the top and selecting File; Open as layers. –Find the picture you want to add and press okay. Once that is selected you can click on the picture and move it where ever you want. Step 6: Making the picture bigger or smaller. If your picture was bigger it may have covered your whole background that I gave you. I will show you how to fix that. 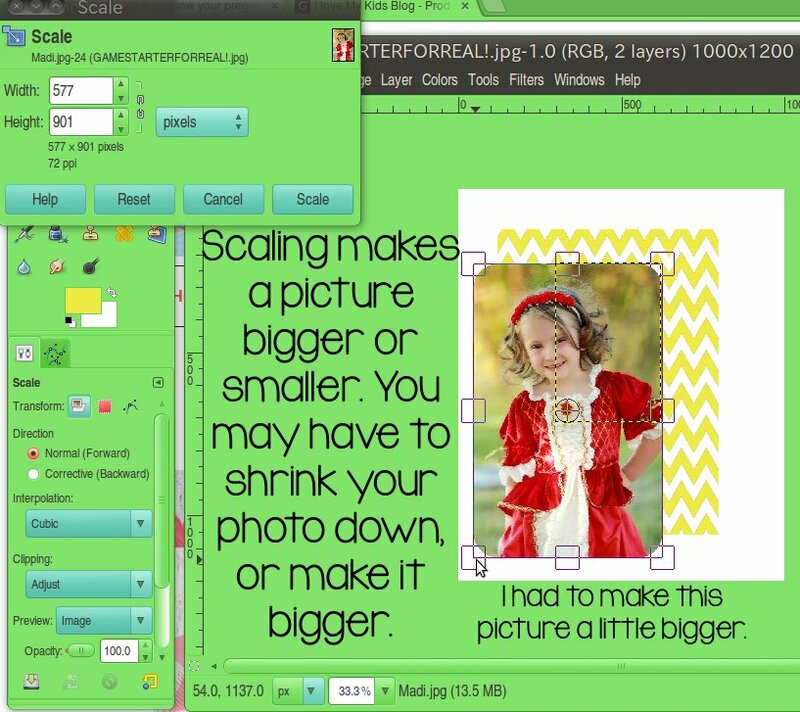 -Click the SCALE tool the scale tool is in the picture below. 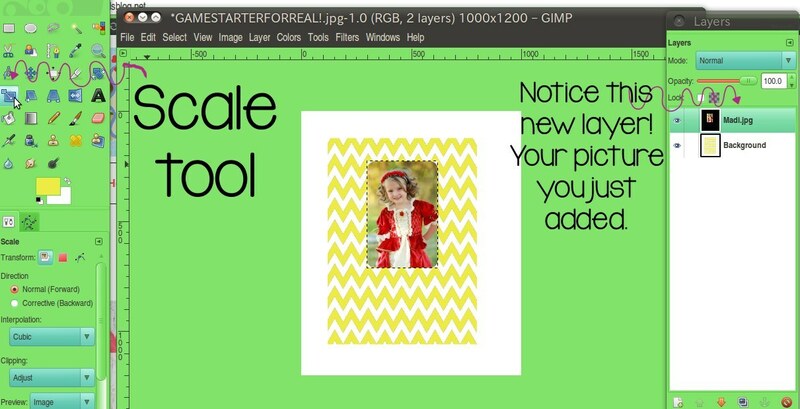 Step 7: Once you click the scale tool click on your photo and box will appear on the screen. If you know the size you want the picture you can type in the numbers. I think the numbers I did was 520×660. -But you can do whatever size you want to do by moving the edges of the picture. -Once you get the right size click Scale in the box. 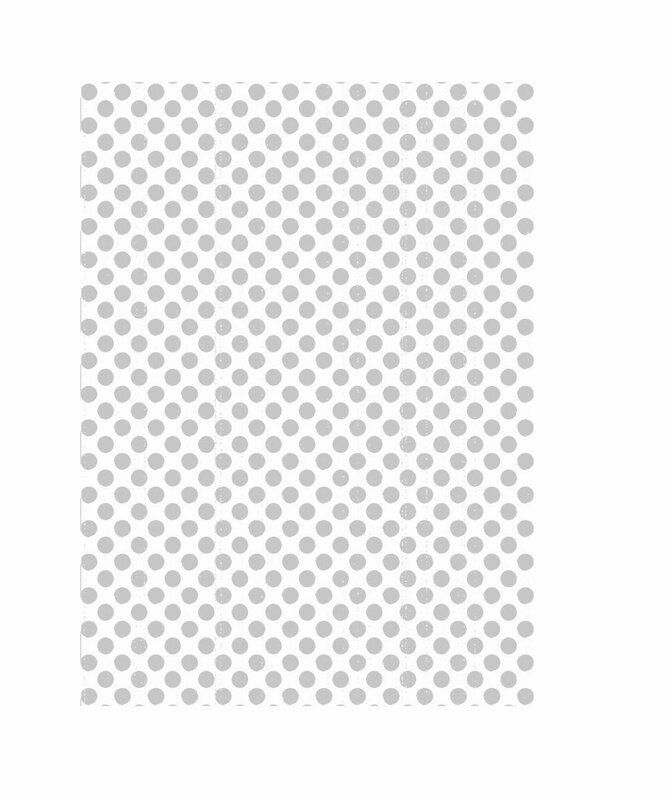 If your picture was bigger it will take 10-30 seconds to change. Step 8: Adding the name! -Type the name in the Text Editor box. In the picture it is behind my layers bar, if it is behind like mine is in the picture just click it and it should pop up ahead of the layers bar. Type in the name in the box. To move the name you just need to click on the box and you can move it where you want. You’re done and all you need to do it save it. Click File; Save as; Save wherever you want it. 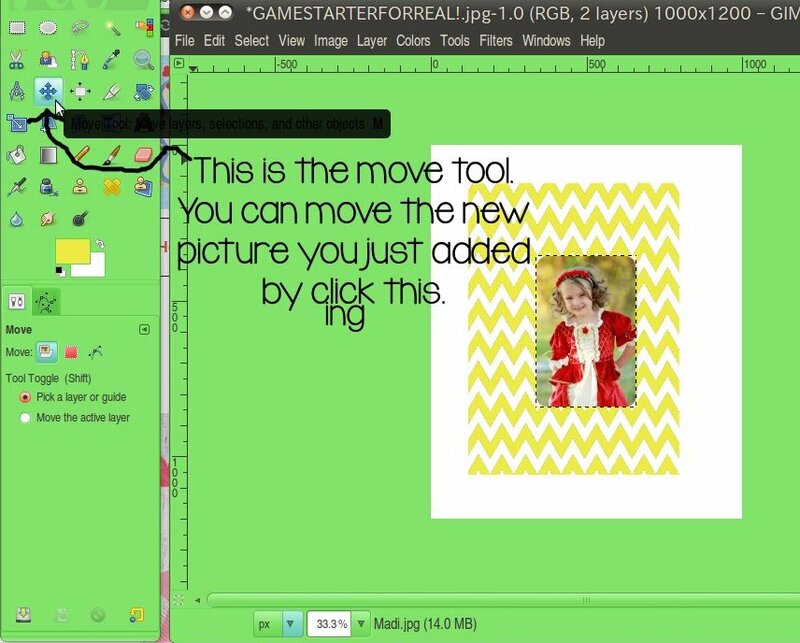 There is my Gimp tutorial on how to add a picture and change the color. I hope this helps and feel feel to ask questions! 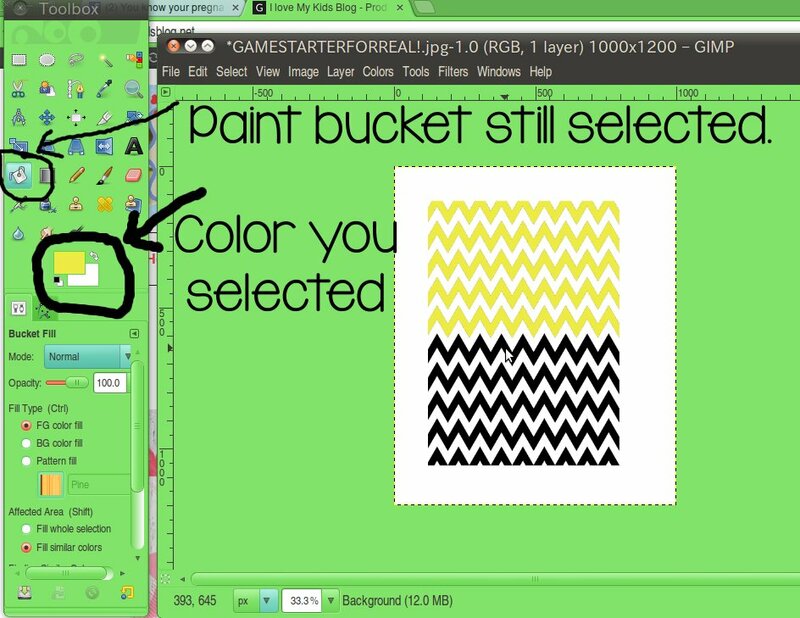 To go back to the tutorial on how I continued making my matching game – CLICK HERE!